Abbas Mohammed cartoon: Palestinian paper allegedly prints prophet's image. 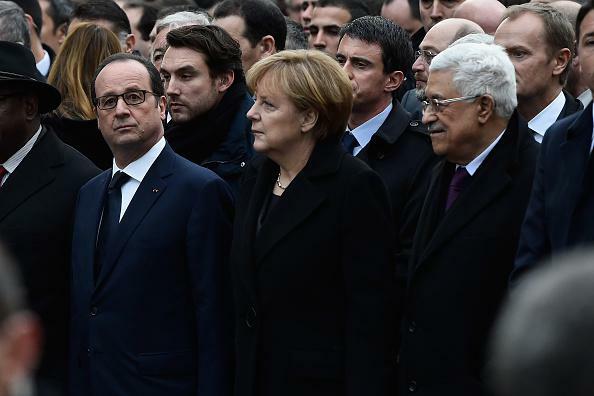 Abbas, right, with French President François Hollande and German Chancellor Angela Merkel. A drawing in the West Bank-based newspaper al-Hayat al-Jadidah on Sunday showed a robed man standing astride Earth and reaching into a heart-shaped pouch to sow seeds of love around the world. The caption reads: “Our Prophet Muhammad”. Artist Mohammed Saba’aneh, a Muslim, said he meant no harm. The figure was not Muhammad but “a symbol of humanity enlightened by what the Prophet Muhammad brought”, he wrote on Facebook.